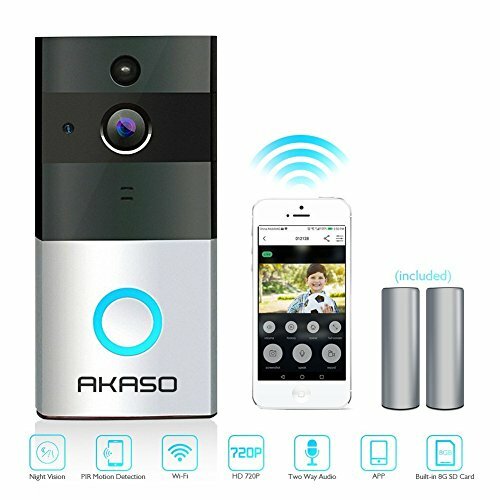 - ❤TRUE WIRELESS & EASY INSTALLATION: No wires and cables are required, just download the APP, then connect it to your doorbell, you can have access to 720P HD live video at any time from your cellphone. - ❤LOWER POWER AND ULTRA-LONG STANDBY TIME: Adopt ultra low power technology, in this mode, the smart doorbell working time more than 4 months, standby time more than a year. It will automatically remind you when the battery power is low. - ❤TWO-WAY AUDIO WITH NOISE CANCELLING: Allows you to talk to your visitors wherever you are, home,office,outdoor and driving.You can watch real-time 720P HD videos on cellphone. The volume level can be adjusted. It may be more convenient to remind the owner to turn up the doorbell voice in a noisy environment. - ❤SMART PIR MOTION DETECTION AND LOOP RECORDING: Whenever any motion is detected, camera sends alert to your mobile phone, the sensitive time is adjustable. 8GB SD memory card provides enough storage for the doorbel Loop Recording. It also automatically covers the expired video files, easy to manage the monitoring records. - ❤IR NIGHT AND 166 DEGREES VISION: This video doorbell wireless is equipped with 6 pcs IR led light. 166° wide range video Doorbell bring a panoramic view of your door. Taking photography and record video at day and night enhance your safety and comfort. Automatic coverage of early videos to make monitoring more intelligent.